Probably no concept is more fundamental to the Post-Modern aesthetic than that of “appropriation”: the reuse of images and materials borrowed from other sources. And no concept has generated more controversy. The amalgamation of historical images by contemporary artists like Gerhard Richter and Anselm Kiefer has been lauded as complex social and cultural commentaries. The wholesale “borrowings” by artists like Richard Prince, on the other hand, have attracted charges of plagiarism and sparked numerous legal actions. The task confronting art critics and historians, copyright lawyers, and cultural anthropologists, therefore, is one of differentiating between the legitimate and the illegitimate uses of “appropriation,” and the idea that continually emerges in this discussion is that of “recontextualization.” Simply stated, “recontextualization” refers to the manner and extent to which materials borrowed from one context are reconfigured in a different context to assume different signification. A fine example of “recontextualization” is the work of Margery Pearl Gurnett. Gurnett appropriates images from a variety of sources, including many of her own creation, incorporating them in new contexts with different significations. And the means by which this “recontextualization” is accomplished is glass. Layering semi-transparent image upon image under thin panes of transparent glass, the artist creates a composite image in which several images are perceived literally through each other. Perceiving the images simultaneously rather than serially changes the temporal dimension with which we apprehend them. In a traditional painting or collage, the eye moves over the flat surface reading each image or part of an image in sequence. In Gurnett’s work, the composite image is apprehended at once and seems to resonate with associations and multiple levels of meaning. A motif which appears in various forms in many of Gurnett’s pieces seems to suggest the non-linear way in which her images work: the spiral or helix. As a symbol, the helix is fraught with significations. It reminds us, of course, of the double-helix-shaped DNA molecule, which lies at the heart of all living things. … It is also associated with the mysterious Fibonacci Series, which scientists and mathematicians increasingly find as the basis of many forms in nature. In art, the Fibonacci Series has for centuries been associated with the ideal of the “Golden Section.” But to this writer, the spiral or helix recalls all those movies (Spellbound, Mirage ?, Vertigo, etc.) and television shows (Twilight Zone) of the ’40s, ’50s, and ’60s in which a helix is used to suggest hypnosis or regression in time and memory: in other words, regression to a psychological space where meaning becomes fragmentary and associational. The helix is an apt symbol of the way we respond to Gurnett’s images. We do not “read” them as such; we delve into them. Their meaning is not clear and rational; it is associational and suggestive. We feel that it exists only momentarily on the periphery of our understanding, somewhat like the apprehension of an image in a kaleidoscope. In some cases, the associations are of forms. 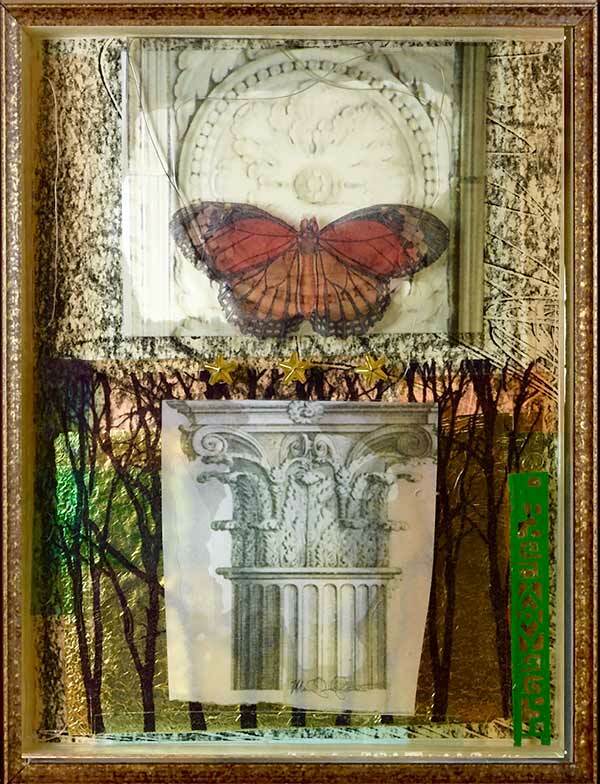 In “Classic and Butterfly,” for example, the image reverberates with repeated “S” curves, while in “3 Star Monarch,” the form of the Monarch’s wings is duplicated by the fluting on the Corinthian column and by the low relief on the medallion. In other works, the associations are clearly psychological. The skipping children in “Childhood” are silhouetted against images suggesting both freedom and rhythm. One of the most interesting associations involves variations in scale and perspective. In “Flatiron,” we encounter superimposed views of the Flatiron Building from various perspectives and in various levels of detail. “Go Deep,” moreover, requires that we do just that: delve ever more deeply into an object or image. Here the object is a tree, which we see in ever greater detail right down to its cellular structure. The image presents a conflation of macrocosm and microcosm. The point of these pieces, as of all of Gurnett’s work, seems to be that although we may see serially, we apprehend holistically, and our apprehension is rooted neither in a specific time nor a specific place.